Counterfeiting in poker is not exactly a strategical concept, but it's something that you should be aware of and be prepared to deal with whenever it crops up. Even if you've only played poker for a week, you have more than likely been counterfeited at least once or twice -- you just didn't know there was a name for it. So here's an explanation (with examples) of counterfeiting in Texas Hold'em with a quick guide on what to do if and when it happens. What is counterfeiting in Texas Hold'em? You are “counterfeited” when a card comes on the board that makes one or more of your holecards redundant (no longer as useful), without the basic value of your overall hand changing. Note: Despite the exciting name and my little image at the top, there's nothing illegal about counterfeiting in poker. It's a perfectly legal (albeit annoying) occurrence. It doesn't have much to do with dodgy money either. Being counterfeited in poker is never a good thing. Even though the basic value of your hand hasn't changed, it usually means that you're either going to end up losing money or not winning as much money as you could have done if you hadn't been counterfeited. Examples of counterfeiting in Texas Hold'em. As awesome as that definition was, there's never any substitute for a good set of examples when trying to explain a specific concept. Here are 2 (and a bit) common ones that you'll most frequently run in to. Your pair of 4s has been made completely redundant thanks to the overpair on the board. The T on the river has counterfeited your pair of 4s. 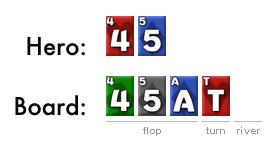 Your hand still has the same basic value as before (two pair), but nonetheless your expectation for the hand has decreased because of your counterfeited pair of 4s. 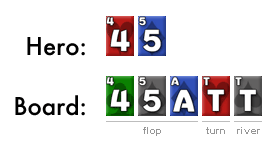 You are forced to use the pair of Ts on the board to make a two-pair hand of Ts and 5s, replacing your original two-pair of 5s and 4s. You still have that pair of 4s, but it's effectively useless because there is no such thing as three-pair in Texas Hold'em. You've lost the advantage that using both of your holecards to make that original two-pair gave you. 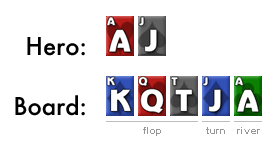 If your opponent had a pair of As on the turn, they will now have a better two-pair hand than you (As and Ts). In addition, if your opponent has a pocket pair of 66+ they will again have just made a better two-pair hand than you on the river. 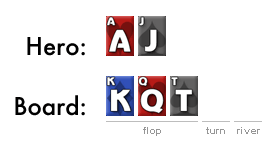 So whereas if you hadn't been counterfeited (the board not pairing) on this river you could have won a decent amount of money from an opponent with top pair only, you could now easily end up losing money to a new and better two-pair hand. 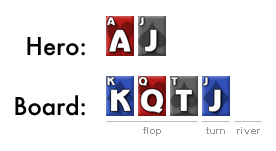 That's pretty annoying, because now any other player at the table with any random Ace will have a straight too, plus you're less likely to get much more action from one-pair or two-pair hands because the board looks so scary. 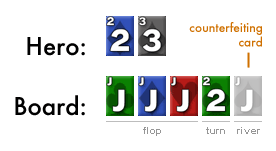 Again, you still have the nut straight (so your hand value hasn't changed), but you expect to make less money from the hand than if the J didn't show up on the turn. …so now every single player left in the hand has the nut straight. Your original straight has been completely counterfeited, as both the Ace and Jack in your hand have been rendered useless. I've pretty much explained the negatives in this hand as we went along. In a nutshell though, the cards in your hand gave you less of an advantage as you proceeded to be partially counterfeited on the turn, and then fully counterfeited on the river. You will now get no value from pairs and sets that your opponents might have held, which could have resulted in winning a pretty big pot for yourself. Instead, you will just split the pot with the remaining players in the hand. The two-pair and straight counterfeiting examples above are the most common and obvious counterfeiting situations you will run in to. However, here are a few more for good measure. Note: I won't go in to too much detail with these, as I'm sure that you'll be able to see what's going on and understand why the “counterfeit cards” are not good for our overall expectation. Any player with a card higher than a 3 will beat your hand due to them having 4-of-a-kind with a better kicker. On the turn, any player with a heart (the suit, not the organ) will now beat your 3-high flush. On the river, any player with a heart still beats your flush, but you now split the pot with players that do not even have a heart. Why is it good to know about counterfeiting in Texas Hold'em? So now you know all about counterfeiting, what use is it? It's not like you can prevent it or do anything about it once it has happened. The key thing with counterfeiting is to realise and accept what has happened, and to not let it frustrate you. Many amateur players get attached to their hands and fail (or intentionally ignore) the fact that their hand has been counterfeited. They will continue to put more money in to the pot as if they hadn't been counterfeited, which is obviously a terrible, illogical and unprofitable thing to do. Being counterfeited is annoying and it can even seem unfair, but you have to remember that it happens to everyone from time to time. Just learn to accept it. You either decide to deal with it or you don't, and if you don't, prepare to lose money. Take the current strength of your hand for what it is and go from there. If you can keep focused when you are counterfeited you will save yourself money, and that's the best possible outcome in these inevitable situations. Evaluation on counterfeiting in Texas Hold'em. 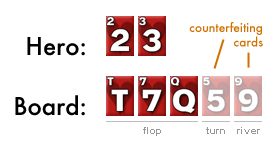 Counterfeiting happens in all variants of poker where community cards are dealt, most notably Omaha Hi Lo thanks to the two holecards that players are forced to use. 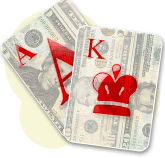 In this article I have focused on counterfeiting specifically in Texas Hold'em. There aren't many in-depth articles out there explaining counterfeiting in poker, but as usual, the wikipedia article on this subject has a decent explanation with a few examples. In conclusion, being counterfeited isn't something you can control or prevent, but you can control the way you play afterwards (which is the important part). Counterfeiting situations are a lot like bad beats, so you should learn to deal with them in the same way.